Following the leakage of graphic and emotionally-disturbing video, French parliament passed a vote requiring the installation of CCTV cameras in slaughterhouses. The vote, passed 28-4 on 14 January, is expected to widely roll out 1 January 2018 if French Senate decides to make it a law. Leading up to the Senate vote, 263 cameras will be placed in select slaughterhouses for an experimental testing phase. If after testing the vote becomes law, an independent commission and a national slaughterhouse ethics committee must be formed. Violating the law would land a person with up to a 12-month prison sentence and a €20,000 (£17,299) fine. The cameras will be placed “in areas where the animals are delivered, kept, immobilized, stunned, and slaughtered.” MPs adamantly proclaim that the purpose of the cameras is not to impose on workers, but to watch for cases of animal cruelty. In accordance with the vote, videos would be available for veterinarians and animal welfare authorities to view, ensuring that proper practices are followed in the nearly 1,000 slaughterhouses across France. Footage will be held for one month. A study done by IFOP, French government public opinion institute, reveals that 85% of French citizens support the vote. Initially spurred into action by the upsetting video, the true point of consideration came in the form of a 225-page parliamentary report commissioned by France’s National Assembly in March. 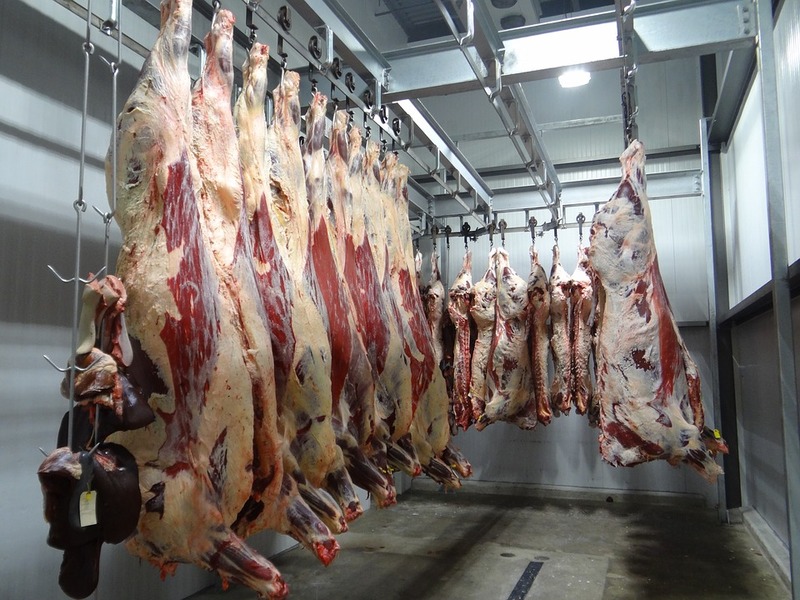 After the seeing the shocking footage, the report was called for as parliament, no doubt, sought for guidance within its 65 proposed measures to improve “transparency and the inadequate controls” in abattoirs. French rural code and a 2009 European Regulation state that, when it comes to animals for slaughter, “the pain and suffering” is to be minimised “through the use of properly approved stunning methods, based on scientific knowledge and practical experience.” Animals for slaughter, according to the codes set in place, must be stunned (i.e. unconscious) at the time of death. Allowable forms for stunning are electric shock, CO2 gassing, or shot with bolt pistol and are repeated as necessary. As per the code, the method of stunning should be monitored through “animal based indicators.” Once the stun has been administered, “animals have to be regularly monitored to ensure that they do not regain consciousness before slaughter.” Veterinary checks are meant to be a regular occurrence. The code and regulations are in place to make the systematic processing of animals emotionless and removes the idea of suffering from the equation. The video, seen here (fair warning – it’s not pretty), is a harrowing hard look at the realities of abattoirs. Wrapping the act of murder in red tape and rules makes it a pretty enough package to observe from afar; however, when staring the gruesome images of cruelty in the face, it becomes harder to put emotional distance between yourself and your meat. The horrific suffering is unimaginable – a conscious calf desperately struggling with a half-decapitated head, a sheep still moving despite a slit throat, a sheep needlessly stabbed in the eye before being slaughtered, and many instances in which animals are subjected to pain without first being stunned into unconsciousness. Animal rights group L214 are responsible for the footage which shows workers committing unnecessary and violent acts of animal abuse; repeatedly bashing sheep over the head, throwing a lamb against a wall, and countless other cases of violations. The animal rights group obtained the footage via a hidden camera which collected video between November 2015 and late May. Le Monde obtained exclusive access to the footage, reporting on the disturbing issue 29 June 2016, the same day that L214 submitted a complaint to the courts on the grounds of animal abuse and cruelty. Taking a note from L214’s book, animal rights organisation Animal Aid filmed inside ten random UK slaughterhouses. The footage has prompted the group to call for CCTV cameras in abattoirs. Several other organisations support the call to action. Defra Minister George Eustice claims that the installation of such cameras would be “relatively modest,” however the government has yet to respond. Since 2008, Arsac has fought for the closure of slaughterhouses and is a proponent for meatless options as “there is no happy meat.” At the time the footage was shunted into public awareness, L214 was petitioning for the availability of vegetarian/vegan options in schools and the larger community.